When creating a giveaway one of your options for creating an entry for users is to input options for users to select using checkboxes. 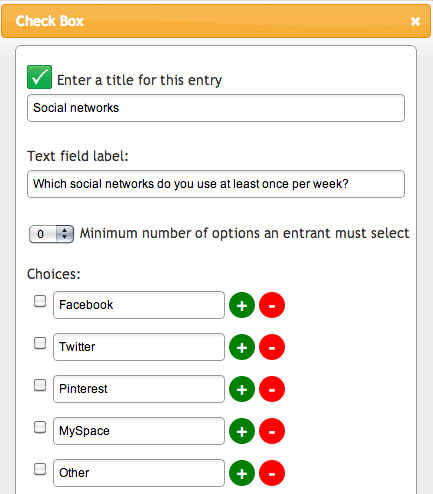 This entry type has a wide range of options from allowing users to opt-in for communications to gather feedback and input. To add checkbox entry to your giveaway’s entry form select the checkbox entry from the list of options on step 2 of the campaign builder. You have the choice to make this a required or optional entry for users. Requiring users to select options: In addition to the entire entry being required or optional you can opt to ask users to select a minimum number of choices, from 0 to 10. Each of the choices that you enter will appear within your entry form along with the entry’s title and the description or instructions that you enter for the users. Pre-checking options: For each option included within the list you’ve created you are able to determine whether it is pre-checked or un-checked by default in the entry form. This can be used for opting-in or opting-out of a subscription as well as highlighting one or more options from the list. By accessing the real-time reporting for your giveaway you are able to view the total number of times an option from a checkbox entry has been selected. This graph gives you a quick and easy way to view how these options are comparing against each other. Each entrant that has completed this entry will also have all options that they have selected listed beside their email address. This report can be exported to a CSV file at any time. Email newsletter opt-in: One use for a checkbox entry is providing a simple and quick way for entrants to opt-in to your communications, such as an email list. When you are setting up an opt-in or opt-out for email you can choose whether this is required by selecting the number of options that an entrant must select. For example, if there is only one checkbox and you are requiring the entrant to select a minimum of one, you have effectively made this opt-in required for the entrant. If you have multiple email lists you may list them all and only ask the entrant to select a minimum of one newsletter to opt into. You can also integrate MailChimp, Constant Contact or Mad Mimi into your entry form to automatically sync your entrants with your newsletter lists in your email service provider’s account. Questions and feedback: Another common use for checkbox lists as entry types is including trivia, polls or survey questions within a giveaway. This is a simple way to gather feedback and information about what your entrants are interested in so that you can cater your future giveaways and content toward their interests.